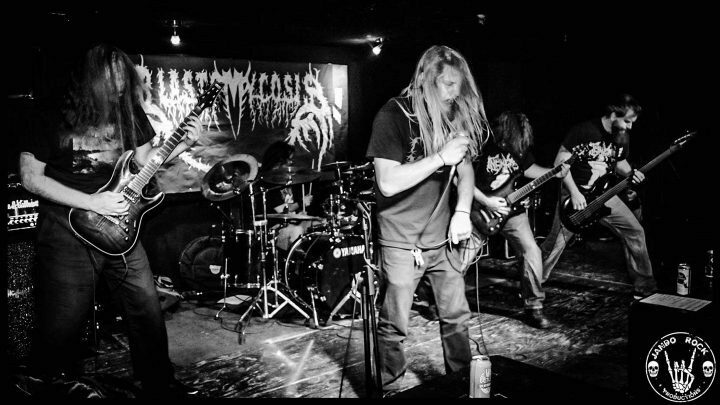 Blastomycosis was formed in 2007 by Phil “Fetus” Baker and Tristan Biggar. Initially started as a side project of straight forward, no nonsense death metal. Samples placed on myspace got the attention of CDN Records. The side project became a full blown band as Blasto was picked up for a full length album. They would churn out a quick demo in 2008 and complete their first full length The Putrid Smell Within in 2009. After an East Coast tour with LIVIDITY in 2009, Blasto slowed down. A few members were purged and they began compiling tunes for a new record. In June 2013, Phil Baker would step down as vocalist and be replaced by Isabelle Tazbir. She would provide vocals for Blastomycosis’ 2nd full length album Covered In Flies and Afterbirth, released digitally in 2015, then picked up by CDN in January of 2017. Isabelle would step down in late 2015 and was replaced by Mike Bain. With this current line up, Blasto is poised to record a brand new album, which should be finished in 2018. New CD from this infectious groove laced brutal death/grind from Canada. Their 2nd release. Brutal Gore Grind from Ontario, Canada. One of the most brutal releases in recent years from Canada.